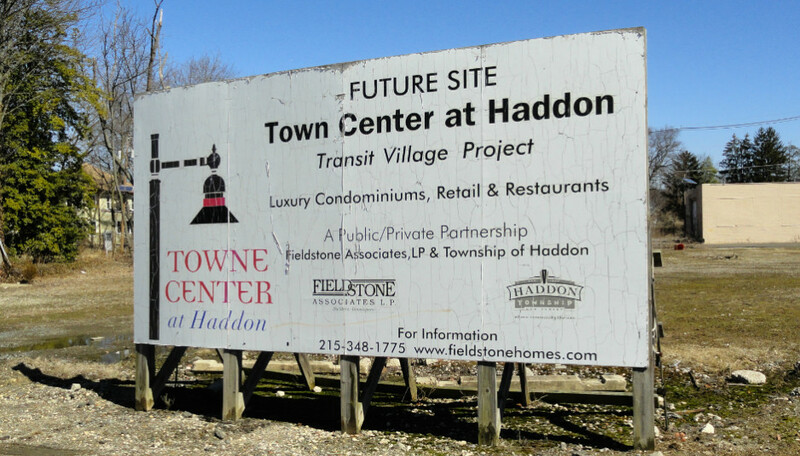 Could a Transit Village Designation Help Haddon Twp. Redevelop? You are at:Home»Business»Could a Transit Village Designation Help Haddon Twp. Redevelop? Haddon Towne Center. Credit: Matt Skoufalos. New Jersey state agencies manage a million-dollar pool of grants for communities that develop with smart growth principles, but fewer than 20 towns statewide participate. Haddon Ave. Credit: Matt Skoufalos. On a main South Jersey thoroughfare like Haddon Avenue, the borders of which are finite, and upon which vehicle parking has been a point of contention in every local government it touches, building a 252-unit, five-story apartment complex within sight of the Westmont PATCO Hi-Speedline station would seem an ideal test case for the employment of smart-growth principles. But throughout the tortured, eleven-year history of the Haddon Towne Center project, which, in its latest iteration, will proceed in October for a final site plan review, many of the elements of smart growth have been lost in translation from the original project or abandoned altogether. Compact building design that prefers structured over surface parking, preserving greenspace? A part of the initial plan that’s no longer economically feasible, according to developers Fieldstone Associates LP. Building with a mix of uses to revitalize community life and limit dependence on cars? Fieldstone tried to back out of the commercial component of its plan altogether, which now includes first-floor residential space in both buildings that face Haddon Avenue. Fostering “distinctive, attractive communities with a strong sense of place?” If the Haddon Towne Center is to be that, it will have as many hurdles to clear in the execution of its plan as in the legal wranglings that led the community to this point. Attorney Donald Cofsky, counsel to the Haddon Township Planning and Zoning Board, said that initially designating the Dy-Dee site for redevelopment created a zoning overlay for the grounds that “was officially approved and blessed by the court,” but which doesn’t “necessarily tie anything in to these areas in need of redevelopment. Original Towne Center Plan. Credit: Delware Valley Smart Growth Alliance. So if the Haddon Towne Center project is adding a five-acre apartment complex at the edge of town—and five acres of shoppers and diners and taxpayers along with it—what is being done to integrate that structure into the downtown business district in specific, and into the community in general? One possible mechanism to help add local revenues while engaging a public dialogue about the execution of the project is for Haddon Township to pursue a Transit Village designation. A smart-growth partnership between the state Department of Transportation and NJ Transit, the Transit Village initiative “creates incentives for municipalities to redevelop or revitalize the areas around transit stations using design standards of transit-oriented development (TOD),” focusing on the use of trains, buses, bicycles, and foot travel instead of personal vehicles. A Transit Village designation can afford a community priority access to money from nine different state funding sources, such as Main Street New Jersey, the Department of Community Affairs, the Council on the Arts, and the Department of Environmental Protection. Approximately $1 million in state grant aid is administered by the Transit Village Task Force, for which only a handful of applicants compete annually. The application process requires communities to consider their mass transit infrastructures and demonstrate “municipal willingness” to grow “jobs, housing, and population” around them. Towns are asked to designate a transit village district within a half-mile of their transit facility, undergo a “visioning process, with stakeholder engagement,” and add transit-supportive elements to their master plans. In short, the Transit Village program requires communities to thoughtfully activate the central areas around their mass transit facilities, and offers financial support for participating in that process. 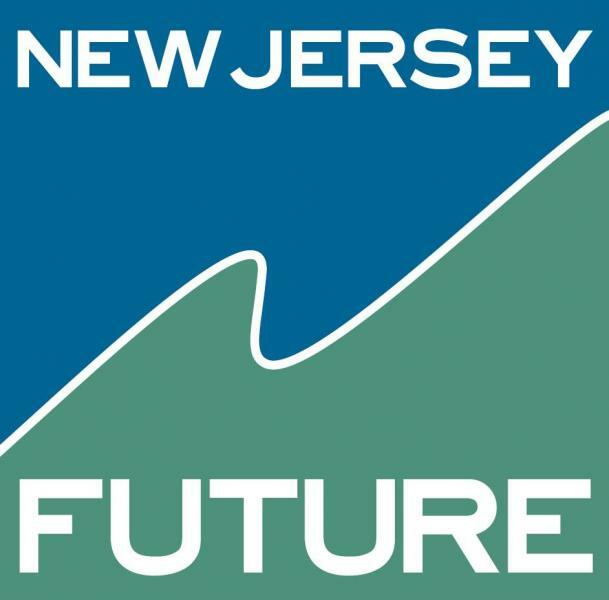 New Jersey Future logo. Credit: New Jersey Future. Pete Kasabach, Executive Director of the Trenton-based nonprofit thinktank New Jersey Future, described the Transit Village program as being aimed at “towns that are already on the right path,” and which have a level of community engagement that motivates change. Developers will take their cues from the tone set by a community, Kasabach said; a consistency of thought from local leadership and residents protects everyone’s investments and mitigates risk. Businesspeople can be valuable partners in the process, he said, “but that requires the town being a good partner. New Jersey is home to several historic towns that have reinvented themselves and their downtown streets by creating avenues that offer an authentic sense of place, he said, ticking off names like Morristown, Princeton, and nearby Collingswood as examples of “towns that have looked at their own character as an asset, and have worked with a private market” to enhance it. “The fundamental key to success in all these towns is leadership,” Kasabach said. “Around the country, places that have redeveloped well, it’s not just that they have a plan, it’s that the plan is supported by the community and the political establishment, even when there’s changes in leadership. 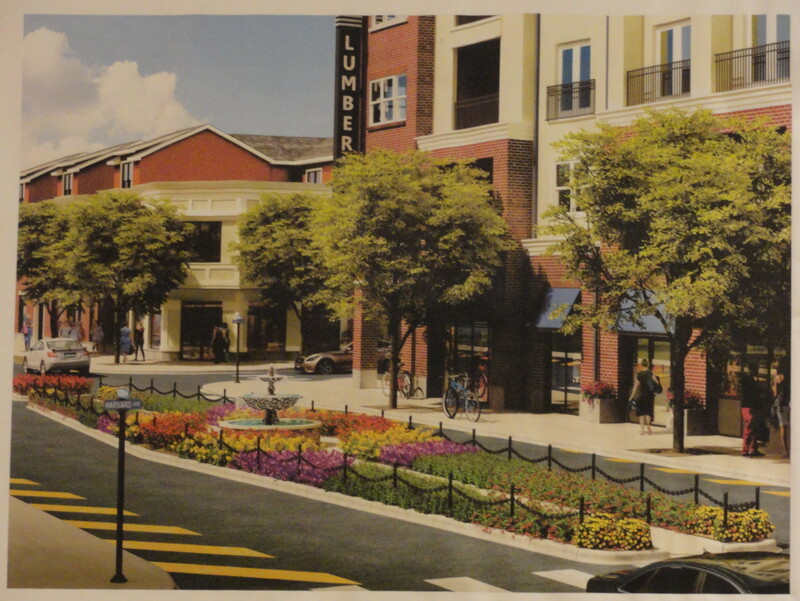 Rendering of the median/fountain project at the LumberYard in Collingswood. Credit: Borough of Collingswood. Although a project like the Haddon Towne Center is innately designed to drop several hundred potential consumers into the main business corridor of the township at once, “density doesn’t automatically mean good design,” Kasabach cautioned. “You don’t get the benefits of density if you don’t design well,” he said. “You can build 250 units about 50 different ways. You can do it in a way that looks like a prison, like single-family houses, like an apartment building, like a fort that turns inward, like a community that turns outward. Stephanie DiPetrillo, Senior Research Specialist at the Alan M. Voorhees Transportation Center at Rutgers University, believes that until the final site plan is approved for a project, “the town can always negotiate. “You show up at the planning board meeting, you show up at the zoning board meeting, and you let your elected officials know what you want,” DiPetrillo said. “In the best of all possible worlds, there should have been a public visioning process for what would be placed on the site…probably two or three years ago,” she said. Despite those caveats, there are still opportunities for the township to pursue additional state aid as a Transit Village. The problem is that none of those dollars are guaranteed; indeed, for several years, there was no money dedicated to the Transit Village project, said James Maley, mayor of Collingswood—the only other community in South Jersey (aside from Pleasantville) to have secured a Transit Village designation with its Lumberyard project. “Every time we’ve ever checked about it, we’ve been told there was no money,” Maley said. “We also hoped there would be some regulatory advantages to being there. [If there are], they sure don’t do much of a job letting TOD towns know [about them],” he said. “It’s nice to be able to tell people that somebody gave us a gold star once, but that’s about it,” the mayor said. The Collings at the Lumberyard. Credit: Matt Skoufalos. 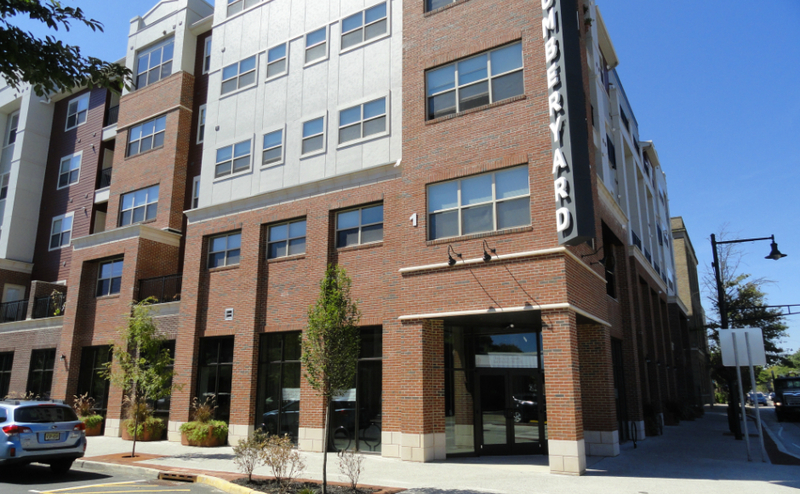 Maley said that the design of the Lumberyard alone represents the commitment of Collingswood to transit-oriented development. By extending the length of Atlantic Avenue, which runs beneath the PATCO Hi-Speedline, to the other side of Collings Avenue, and by limiting parking onsite, he said the borough helped orient the project towards the train. But otherwise, Maley said, “there’s no magic wand required. “You put a property out on Haddon Avenue, and you build another road closer to the train, like you’re oriented toward it,” he said. “You build it that close, and you’re going to get people using it. But DiPetrillo argued that even if being approved as a state-designated Transit Village doesn’t yield immediate financial dividends, going through the process “is healthy for your community. Backyard chat with Teague. Credit: Matt Skoufalos. 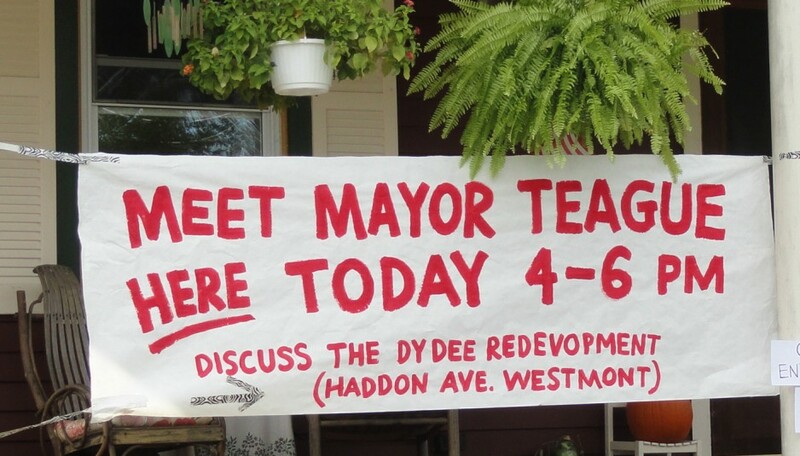 The application process also opens up a channel for public dialogue, DiPetrillo said, which Haddon Township officials have described as being absent from the entire process from the beginning. 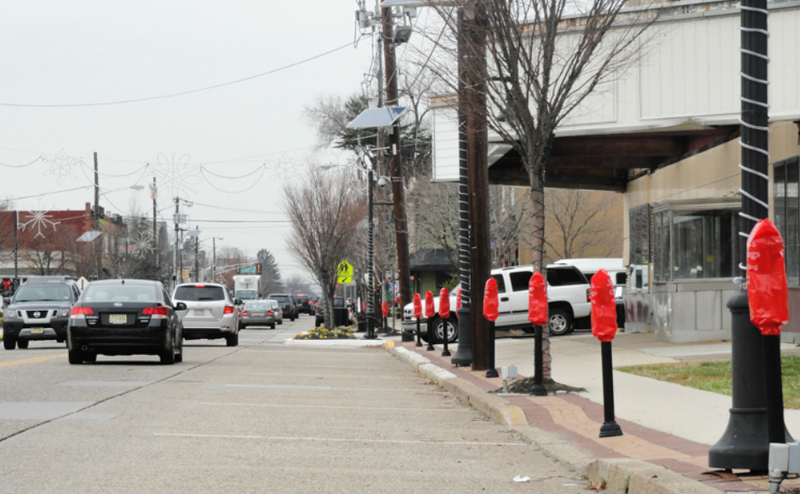 Plus, if Haddon Township is able to secure state funds for community improvements, those dollars could be dedicated to streetscapes, beautification efforts, pocket parks and green space: elements that could improve business in a downtown commercial district that stands to benefit from the infusion of human capital at its periphery. “Some of those funds would be distributed among the various transit villages, and if you have a worthwhile project, you would be able to designate those funds,” DiPetrillo said. The process also could give Haddon Township additional points in its application for other local aid funding, she said—but of course, “it’s not a guarantee. This article is the first of a two-part story exploring planning and design issues around the Haddon Towne Center project. For part two, which explores additional and specific revisions that could be made to the project to bring it into alignment with smart growth principles, click here.